An iconic moment from the Walking Dead comics finally came to fruition in the Season 6 mid-season premiere of The Walking Dead, when Carl Grimes (Chandler Riggs) was hit in the eye by a stray bullet when Ron's (Austin Abrams) gun went off after Michonne (Danai Gurira) stabbed him. The circumstances of the shooting were slightly different, but the image of Carl standing with his mangled eye saying "Dad?" is taken directly from Issue #83. Chandler Riggs swat down with TV Guide and spoke about that moment, which he was excited for. When did you find out this was coming? Because it's in the comics, but the show has diverged from the comics before. I was out in LA for Talking Dead for Episode 15 of last year and Scott wanted to meet up with me for some lunch and to brief me for the next season. And that was when he told me that I was going to be losing an eye. And I was so excited, because I didn't know they were going to go through with it or not. 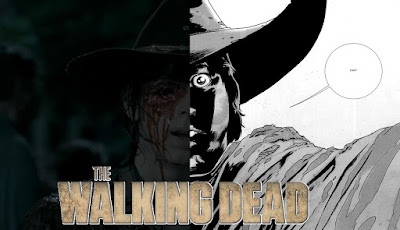 Because they didn't do it with Rick's hand, so I didn't know if they were going to do something different with Carl. But when Scott said that they were actually going to do it, I was so, so excited.... In the comics, it was a big turning point for my character, so I suspect that in the show it'll be a big turning point for my character, too. It'll make him more hardened and tough, hopefully. This is the second time that Carl has been shot on the show. Which time felt more traumatic, both for you and for the character? I think the eye is more traumatic for both of us. For me, as an actor, I have to deal with one eye on the set now. And for Carl, he's going to see the world a lot differently as the result of this one incident. I think this time is going to harden him more.